At a recent Smith Institute debate on the budget, I was surprised to find myself agreeing with Mike Devereux of the Oxford Centre for Business Taxation. In essence he said that the debate between the parties was largely inconsequential on deficit reduction. All parties say it has to be done; all say it has to be done reasonably soon, and all think a combination tax increases and spending cuts are essential. The difference between Labour’s preferred 65% cuts / 35% tax and the Tories 80% / 20% is 1% of GDP in reality according to Mike. And as he put it, candidly, either way more than enough was being done to meet the requirements of the markets – if the promises are delivered. And yet Mike, in making that comment, ignored the elephant in the room: that this uniformity suggests there is remarkable agreement on the role government has to play in the current phase of this financial crisis. The implicit agreement is that it should exit the economy, stage right. And this is where I fundamentally disagree. People may (or may not) intuitively think that government has been overspending and must rein back now – as Tory MP Kwasi Kwarteng claimed during the debate – but this sentiment was more than adequately and accurately described long ago by Lord Keynes, who called it the paradox of thrift. 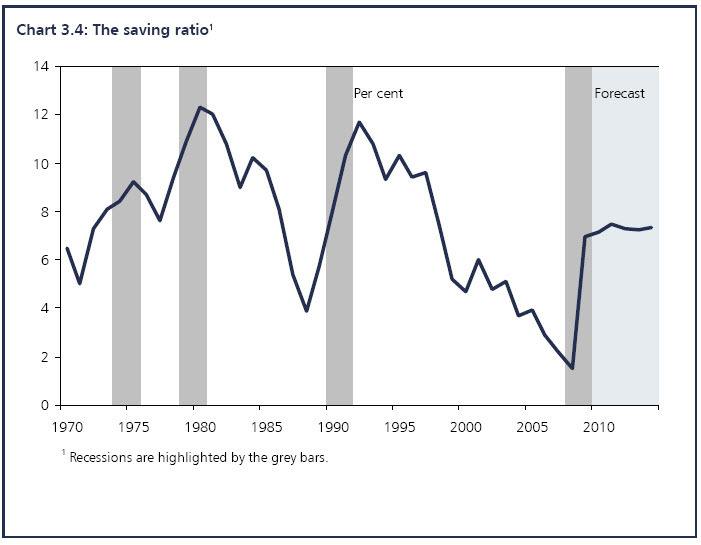 The UK household savings ratio has risen since the financial crisis developed, and is expected to stay high. That means people are not spending. That means there is a shortage of spending in the High Street. And that means companies will not invest. As Martin Wolf has pointed out, the UK private sector savings surplus is running at something like $200bn or £135bn a year as a result now (give or take is good enough here). This means, because these funds have remarkably little use elsewhere since all countries are all in the same boat right now, that these funds are being used to finance our own deficit, almost in its entirety, which is why 90% of our debt is owned in the UK at this time. In other words – the real macroeconomic issue of the moment, the one the whole panel ignored and which the whole debate is ignoring – is the astonishing fact that we are quite able to fund our current scale of government spending and are doing so without difficulty, but the mechanism we are using to fund it is not called tax right now. However, if we don’t want to call the current funding of the deficit tax – instead thinking of it as saving – then the real debate is not about whether we need cuts, since it is apparent that the deficit is being funded and will continue to be funded for some time to come, but is instead how we actually use those funds we are choosing to lend to the government. The Coalition plan is to spend that money on unemployment benefits since it is readily apparent that they want to put 1.5 million or more out of work and that the consequence will be a spiraling paradox of thrift with the result that we will move to depression from recession. The alternative is that we make a very different choice. We could choose to spend that money on investment in our economy. We could do the Green New Deal – the only industrial strategy for the UK written in many a long year but the exact missing part of the equation that is required now. The Tories presented a budget that assumes we want a small state. I guarantee that this sentiment in the country will change very rapidly and very soon when people realise what this really means. As one astute observer put it today, very few people in the UK realise just how dependent they and others are on state services and how much their absence will affect the quality of their lives – even if they still have a job. I do not believe people want a small state. But equally I do not think we will get the state we want by hoping for it or by playing with some minor change to corporation tax rates or allowances. We will only get it by breaking the current epidemic of thrift that is ensuring we can pay for the deficit, but which is also going to be squandered on current expenditure which will provide no chance of paying a return on the debt. An industrial policy will create jobs. It will stimulate the economy. It will send cash back into the private sector. It will encourage spending. It will recreate the tax base. It will reflate government revenues. It will close the deficit. It will create new jobs. If it’s a Green New Deal it will ensure we have enhanced energy security, so supporting the value of the pound as well as earning long term returns. And there will be jobs. This is what macroeconomic policy is. Arguing about tax rates is little more than glorified micro. Or to put it another way, the debate reminded me rather uncomfortably of the rather odd people who came to see me when I was a practicing accountant. They wanted advice on business structures and tax planning for their profits from the business they were about to start which was going to make mega-bucks. But when you asked them what it was going to do they didn’t know – they were going to get the structure right first, they said. That genuinely happened occasionally. And that is what economic debate is like in this country right now – focused on getting the structure right for business – but no one has the faintest idea what the business might be. Those potential clients who asked me those questions were destined to never make money. And the UK is destined to never get out of recession unless we know how we are going to earn the tax base which can restore government revenues. George Osborne, Vince Cable and Alastair Darling have not addressed that key question. And they're also ignoring the glut of savings we currently have – which need a productive home. So, as Gordon Brown's former special advisor Chris Wales said during the debate, we need a discussion on how big the state should be (much bigger than the Tories think is the answer) and how we should pay for it (more tax is the answer) but first we have to get people working. The lack of an industrial policy is the elephant in the room right now. And I’m happy to offer the Green New Deal in the absence of alternatives. • Richard Murphy is an adviser to the Tax Justice Network and the TUC on taxation and economic issues. This article is cross-posted from his blog, Tax Research UK. Quite. You see prediction, especially about the future, is very difficult. We simply do not, indeed cannot, know what are the new technologies which will work, what new desires or wants might be conjoured up in the imaginations of the populace, what new ways of satisfying already extant wants and desires might be invented. Since we do not, and cannot, know these things then we cannot plan for them. And as we cannot plan for them then the dream of a planned economy dies. As do plans like the Green New Deal. It’s exactly because no one does know what the new businesses will be that we cannot centrally allocate the resources to create them. We’re left with the bumbling along of the marketplace, that continual set of experiements by companies, consumers and Uncle Tom Cobbleigh, to see what might be done. Such a pity for those subject to Kip Esquire’s law, that those who advocate planning always see themselves as the planners. But the very justification being used here or planning, that we don’t know what the future holds, is the reason why planning won’t and cannot work. Once there was white hot heat now there’s a green, new deal. Industrial policy has a record of failure stretching back into the mists, Anyone remember the NRDC? And if anyone truly believes that having an entire modern state - the UK - funded by a single province - London and the south east - while every other region runs a deficit economy is sustainable then they learned a different economics/arithmetic from mine. Putting aside the economics; what about democracy? Is the socialist payroll vote good for the UK in the long term? Will the wealth producers continue to fund it when they’re being asked to pay 60+% tax on income and capital gains? But more than all these arguments - and this is adressed to Cliff - I think you should take a long look at the way Murphy conducts his own blog before extending him the courtesy of yours. He is an authoritarian bully who simply shuts down opinon he doesn’t like. If he isn’t prepared to honour the principle of free speeech even when it’s uncomfortable for him I don’t think he should be lauded in columns like this one which do allow the contrarian point of view a hearing. (As does the other TPA lot by the way). As it is all Murphy does is confirm the truism that no society ever willingly adopted socialism. There always needs to be compulsion, a bully, someone with a big stick. Ask the Cubans, North Koreans etc. By “socialist payroll” I presume that Brian Smith means the people working in the public sector, our teachers, nurses, firefighters etc. These people work for the benefit of us all and make life worth living, including the wealth producers among us. Does Brian think that paying income tax of 60% on earnings above say £200,000 is worse than the alternative of making many public servants redundant? Brian might like to read “The Spirit Level” by Richard Wilkinson and Kate Pickoff. The findings of the authors are based on evidence from around the world, not on anyone’s particular ideology, mine or Brian’s included. The evidence shows that almost everything, from life expectancy to mental illness, violence to illiteracy even well-being and happiness is affected not by how wealthy a society is, but how equal it is. Societies with a bigger gap between rich and poor are bad for everyone in them, including the well-off. If Britain became as equal as the four most equal of the rich countries (Japan, Norway, Sweden and Norway) mental health would likely to halve, everyone would get an additional year of life, teenage birth-rates would fall by a third, homicide rates would fall by three quarters and prisons would be closing all over the country. Britain is not a poor country and by 2014 we will be as rich as we were before the recession if we get 2% a year growth. The government shouldn’t panic and impoverish us for the sake of an ideology that many people believe helped bring about the recession in the first place. Sorry Jim but asserting something doesn’t make it true. People are already paying more than 60% on earnings above £150,000 and there is every reason to believe that this will cascade down the earnings table to reach those on £100,000. Tax rates of that proportion are not equitable, fair, reasonable; they are expropriation, confiscation, pure and simple. As Mill had it, we are seeing the tyranny of the majority. (And just for info I’ve never earned more than £60,000 in a year during a working career going back to 1963). As for the Spirit Level I don’t think any recent book has been so completely debunked. It was generally mocked for being excessively selective and, mostly, plain wrong. As for levels of taxation as a proxy for the size of the state, even left wing commentators agree that a state bigger than something between 32% and 36% is oppressive and inclined to drive out or prevent private sector growth. There is no way, for example, that private enterprise can ever start to redress the balance in our client regions unless and until the government, nationally and through policy, starts to reduce the size of the state sector. This does not have to be done destructively, heartlessly, vengefully or via any of the other what I am sure you would call “Thatcherite” methods. Transferring state enterprises to the private sector - workforces intact - would be a start. Abolishing national wage bargaining would also help; again no job losses needed. A freeze on recruitment with an obligation to train existing staff to fill otherwise unfillable posts would be a key driver. There are lots of ways in which the state can be rolled back with no loss of employment, services or municipal values. We have just got to start seeing the role of the state organisations as being something other than that of an employer. Providing jobs isn’t their primary function, it should only ever be a means to an end. I wasn’t aware that there were many state enterprises left (or do you mean the NHS?). And consumers really got fantastic value-for-money from the privatisation of energy and rail providers didn’t they? Just what we need: more corporate cartels. Sorry Brian but asserting something doesn’t make it true. Accepting that there is only 100% to go round then Northern Ireland at nearly 70% must have a fair bit of releasable public sector activity evidenced by a simple comparison with a region like London and the South East where the public sector share is less than 50%. It is axiomatic that at those kinds of public sector share % levels - ie high 60s and 70s - there must be a huge amount of private sector economic activity simply not taking place in the regional economies overall. There is a missing component represented by public for private substitution, poor productivity, high welfarism/economic inactivity and an inability of the private sector to compete for labour due to state subsidy/inflation of wage levels. One would hope to grow the private sector (increase the 100%) while reducing the public or state component at a parallel rate. There’s a load of stuff on the web about optimal state sizing and this is one link http://129.3.20.41/eps/pe/papers/0507/0507011.pdf you might want to have a look at. reflect the preferences of voters who decide on the scale and the scope of government duties. I wasn’t aware until I read Brian’s blog that the book “The Spirit Level” had been “debunked”. The author’s research was initially based on an examination of the health inequalities between groups of people within modern societies. This led onto research into other matters like mental illness, life expectancy etc. The book did no research into consumerism or economic growth (which the criticism of the book majors on), although these things are mentioned in the comment chapters. I found the criticism by doing a a quick internet search and couldn’t help thinking that it mirrored the sceptics view of climate change. Namely it is not very scientific and is advocated by people who believe in economic growth unfettered by governments. Of course my quick search may not have given me a representative view, but I suspect that it did not. In my career going back to 1957, I have worked in both the private and public sectors and found good and bad in both. The point to grab hold of, however, is that we need both in order to have a decent life and the size of the public sector should not be decided by some theoretical percentage but what public services we want. People seem to forget that the increased public expenditure carried out by the last government up to the recession was popular, to the extent that the Conservative party promised to match it should they win power. The huge deficit that we now have was not caused by a sudden splurge in spending over the last few years but by a drop in taxation caused by the recession and the need to bail out the banks, something that would have happened no matter what government was in power. The Coalition Government’s solution to the deficit is to cut it beyond what is necessary for ideological reasons. Unless they change their tune we will end up with public services well below what was popular just a few years ago and it will cause massive resentment when the full scale of the cuts hit home. It doesn’t seem right to me that a temporary crisis caused by a drop in tax receipts should be tackled by permanently making public sector employees redundant. Better to temporarily increase the tax take, which can be adjusted back to current levels when the crisis is over. I wouldn’t mind paying more tax to help us out of trouble. However, I am a Director of a one man consultancy and find that I am going to be asked to pay less tax, because of the proposed drop in Corporation tax. Businesses are getting off lightly if you ask me. But then if you want to know who has the power in our democracy just follow the money. It’s a continuing shame but there’s very little in the public realm to do with political economic theory that isn’t polluted by coming from a particular standpoint or value set. The size of the public sector isn’t decided by popular vote or other expression of want; it’s decided by politicians bribing us with our own money. And to continue the process they have to find more and more of our money. Today’s deficit isn’t caused by a temporary drop in tax revenues; it’s entirely due to an unfunded programme of expenditure going back 9 years to the ending of the then new Labour government’s decision to maintain the inherited Conservative economic and fiscal policy. The deficit began building in year 3 or 4 when Gordon Brown abandoned prudence and reverted to traditional Labour tax and spend populist policies. The need to bail out the banks was trivial, played no part in building the deficit and is, in fact, a rare example of government investment. When the government comes to sell its stake in the two banks it bailed out (there are several thousand banks in the UK and hundreds of thousands of banks in the world) the treasury will make a tidy profit. The quality of life - which the left and the authors of the Spirit Level ascribe to the beneficial effect of public services - is significantly better in the south east where public sector activity is a much smaller part of the economy than in the rest of the UK. Could you honestly favourably compare St Helens with Guildford; Wigan with St Albans or Salford with Croydon or Harrow? Socialism - and outside the south east there’s been very little else - and its baleful impact has seriously depressed the life chances of the bought and paid for voters trapped in its grasp. And now the country is having to pay the price of correcting the endemic problems it has left us all with. All one man bands in business have a choice whether to incorporate or not. Those that do are considered tax avoiders by the left - only a prison wall’s thickness away from tax evaders apparently - and we have IR35 and the like because of officialdom’s attitude to their actions. Incorporation is, of course, voluntary. All one man bands can remain sole traders if they wish and simply pay PAYE and NIC on their income like everyone else. Brian: I agree that most political economic theory is biased and depends on the eye of the beholder. Most of us pick the theory that best suits our outlook on life, which might be making your life a bit difficult at the moment because the economic theory that has dominated over the last few decades was tested to destruction under George W Bush but it still refuses to die. I don’t agree with you that today’s deficit is entirely due to an “unfunded” programme of expenditure over the last 9 years. In 2001 public spending was 35% of GDP and it increased gradually to 40% in 2008. 2009 saw a jump to 45%, which I criticise, but then this was a year before a general election when voters would be expected to be wooed by whichever party is in power. I repeat that the level of spending up to 2008 was popular with the public and the cuts being planned, if implemented, will bound to be very unpopular. Neither do I accept that the size of the public sector is decided by politicians bribing us with our own money. This implies that most people want a minimal state sector, which I for one do not. I want a public sector that yes is efficient, but which provides our society with the services that it needs. I was happier when the last Labour government started to fix the roofs of our schools and improved our other public services than under the previous Conservative government when these things were allowed to be run down. Good public services should not be equated with socialism but with common sense. The Spirit Level does not ascribe the quality of life to the beneficial effect of public services. The book talks about reducing income inequality, which is done either by redistribution or, as in Japan, by greater equality of incomes before tax. You seem to equate quality of life to wealth. There will be wealthy people living in Salford and Croydon but do you think that their quality of life is better than that of the wealthy people living in Guildford or Harrow? I think it is in the interests of everyone, including the wealthy among us, that we strive to live in communities where the gap between rich and poor is not so obscene that it places a strain on community relationships. I used to live in South Africa and my daughter lives in Malawi, where I visit quite often. One would think that the quality of life in a rural african village would be appalling, with little money, few public services, life threatening diseases and just enough food to go round. Well from the consumerist’s point of view it probably is appalling. But on a social level, because everyone is practically in the same boat, I think the quality of life is better than ours. Family relationships are stronger and people tend to help each other out. And when I visit, people actually smile at me and welcome me into their homes. We can learn lessons from these societies. And before you tell me to bugger off to Africa let me say that I am happy enough here, although I am fearful that my future happiness will be put at risk by the Shock Doctrine approach of the Coalition Government. I don’t agree with yours, or the opinion expressed by the left, that public services are popular, essential or even of major concern to most people. For most of our lives public services simply pass us by. We’re at school for a few short years, very few of us go into hospital and while the welfare dependent community is large it is by no means a majority. To most of us, public services mean un-emptied bins, closed libraries, potholes, broken street furniture, desolate parks, missing or dirty public toilets and uncut verges. But whether they are popular or not it has to be recognised that the level of public services - as represented by their cost - varies enormously from one part of the country to another. The idea that this is because some communities have expressed a desire for more or less than another can’t really be argued. And if one part of the country - the bit with a low public services component in its economy - does so much better in every aspect than those with large public service expenditure, then that must say something even to the most biased observer? Schools are a good example here. The private sector typically operates out of buildings that are either conversions from another purpose - typically large old houses - or in buildings that were built 100s of years ago. While some of our private schools are selective - Eton, Winchester, St Pauls etc - most are what are known as “recruiters”. If you can pay their fees they will take your offspring. Independent research says these non-selective schools add 2 grades to the achievement level the children would have reached in the state sector. How do they do this if the condition of buildings is so important? Deflecting attention on to the idea that what British education needs is new schools is a deception and a double one at that. It isn’t the answer and Labour had no intention or means of funding it. As for an increase from 35% to 40%of GDP not being dramatic it’s about 80 billion pounds or roughly half the current annual deficit. Increasing that to 45% equates to 160 billion, of course; just about the structural element in the current annual deficit of £175 billion. Good grief, Brian, I’m beginning to feel sorry you. Public services haven’t passed me by, in fact without going into detail I wouldn’t be writing this now if it wasn’t for the NHS. I would be dead. My three children all received a good state education. My bins are emptied almost without fail. Our library is open (although it might not be after the spending cuts) and we have a decent park. Our roads have potholes in them after the bad winter but I write to the Highway Authority and they do their best to programme in the repairs. Our public services must be popular around the country because otherwise the Conservative party would not have promised to match Labour’s level of public spending before the global recession hit us. The fact that some parts of the UK have a higher proportion of public sector workers might just be because the private industries in these areas suffered the last time a Tory goverrnment decided to cut public spending, putting people on the scapheap and allowing our infrastructure, including school buildings to fall into disrepair. On that do you think it would make economic sense for you to allow your house to fall into disrepair, even if this did not affect your living standards? As for the reasons why pupils in private schools achieve better results than pupils in state schools, I would have thought that smaller class sizes and better teachers might have something to do with it. However, when the pupils get to university a study by the LSE’s Centre for Economic Performance found last week that pupils from state schools are four percentage points more likely to get a first or 2:1. Perhaps this is because the schools in the state sector are in a better state of repair, although I think the actual reasons lie elsewhere. We are now starting to talk by each other and the time has come to stop posting comments. I hope that the public services in your area are still functioning when the time comes that you need them.